Summary: IS fighting in the last ditch, outside powers manoeuvring for advantage. 2,000 a day – including many women and other civilians have fled. The US backed Syrian Democratic Forces has been trying to screen those escaping, and on 24 February was reported to have handed over more than 280 Iraqi and other foreign fighters to Iraq; on 25 February the Iraqi president said 13 Frenchmen accused of fighting with IS would be tried according to Iraqi law (as President Macron has urged they should be). According to the Wall Street Journal US-backed forces are holding more than 2,000 suspected IS fighters, an obstacle to plans to withdraw US forces from Syria. On 28 February the SDF said they had uncovered a mass grave with dozens of mostly decapitated bodies, mostly women, thought to be Yazidis enslaved and then murdered by IS. On 28 February President Trump told US troops at a base in Alaska that US backed forces had retaken 100% of territory held by IS, but that is not true. Fierce resistance was still reported on 3 March. Yesterday 5 March an SDF spokesman said 3,000 people had been evacuated the previous day and a large number of IS fighters had surrendered. According to Syrian media the Syrian air force has mounted airstrikes against IS in the desert west of the Euphrates. The UN reports report “staggering levels” of humanitarian need throughout Syria, with an estimated 11.7 million people requiring life-saving humanitarian assistance. Some 41,000 displaced mainly women and children in Rukban camp, near the Syria-Jordan border, struggle for survival, face hunger and lack the most basic necessities. Since late last month over 37,000 people have fled from Hajin to the A1-Hol camp, three quarters of them women and small children. 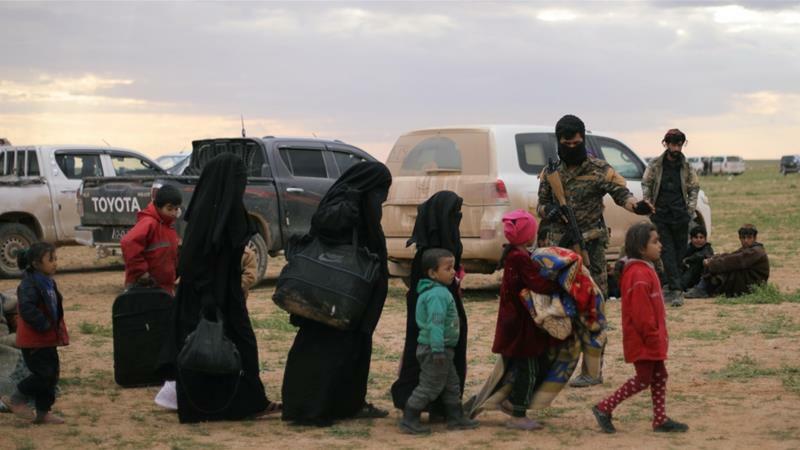 About 13,000 have also arrived from the IS pocket in Baghouz. Trump has agreed to keep 400 US troops in Syria, 200 as part of a planned multinational force to maintain a safe zone in the north-east (possibly including Europeans, a move welcomed by the mainly Kurdish SDF), and 200 to remain in the south in the al-Tanf base near the Iraqi and Jordanian borders. Next week the US and Russian chiefs of staff Generals Joseph Dunford and Valery Gerasimov are to meet with deconfliction in Syria high on the agenda. The resignation of the Iranian Foreign Minister Javad Zarif seems to have been because he was not invited or perhaps even informed of Asad’s surprise visit to Tehran last month; his gamble paid off, his resignation was not accepted and he has been reinstated. Following the Arab league summit last month there was no agreement on readmission of Syria. The UAE reopened its embassy in Damascus in December but Saudi Arabia said yesterday 4 March that it was too early to restore diplomatic relations, and that it would not take part in reconstruction efforts until stability was restored. The US has been lobbying Gulf states to hold off on rehabilitating Syria. Turkey has urged the US to take back weapons which it has provided to Kurdish groups including the YPG. President Erdoğan said on 26 February “The generals with [Trump] said that they have the serial numbers, and they will collect the weapons when all is done. I do not find this sincere.” On 4 March he said that Turkey would clear the area east of the Euphrates, “Otherwise, we cannot provide a sustainable solution for the matter of Syria.” Today 6 March the Turkish Ministry of Defence met the US special envoy for Syria James Jeffrey in Ankara. Benjamin Netanyahu met President Putin in Moscow on 27 February in a bid to block Iran from establishing a permanent presence in Syria. On 3 March he said that Israel and Russia would work together to secure the exit of foreign forces from Syria. Israel’s hundreds of airstrikes in Syria have been against Hizbullah and Iranian targets, and Netanyahu said they would continue.